Michael Church has a worldwide reputation as an authority on the history of Thoroughbred breeding. 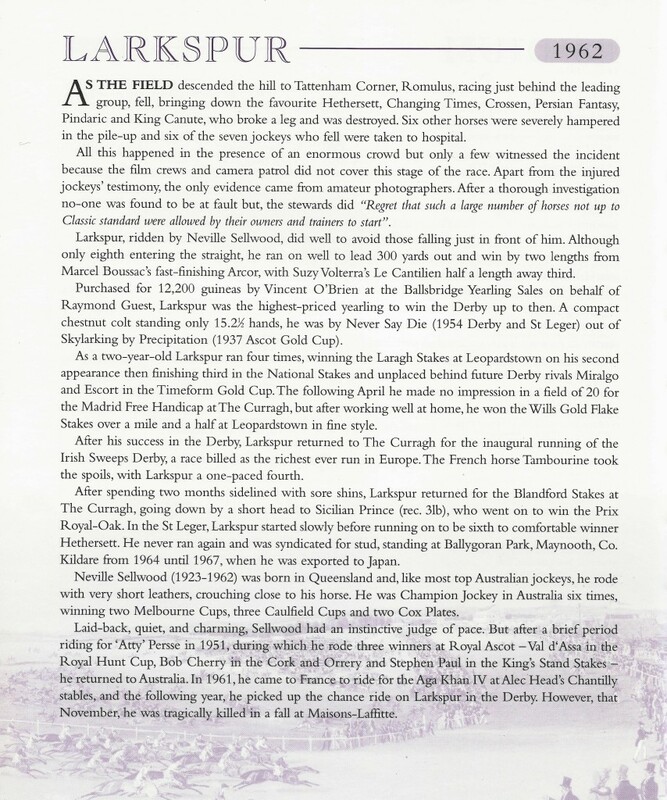 Apart from his lineage chart compilations of the Derby, 2,000 Guineas and Champion Sires, he has also written a dozen books, including the highly acclaimed, The Classic Pedigree, Dams of Classic Winners, and The Derby Stakes. Nineteen sixty two was a bad year for the Derby and public relations were at an all time low. My lasting memory of the race was the loose horses coming in, one after the other, and the crowd too stunned to cheer the winner. The Press and the public had struggled to cope with the three accidents, two years previous, when the Irish challenger Exchange Student broke a leg when exercising on the downs, Sir Winston Churchill’s fancied colt, Vienna, had to be withdrawn, when pricked by the blacksmith on the morning of the race and, thirdly, the well-backed favourite, Angers, broke a fetlock when at the top of the hill. In 1961, Psidium’s friendless victory at 66-1 only added fuel to the fire. So after a Derby where seven horses fell, there were many who supported a move to run the race at Newbury. Nevertheless, Epsom survived as it had done many times before. Here then is my account of the race from The Derby Stakes – The Complete History – 1780-2006.
many of the books in my library are now for sale. To view the list, go to the top of the page and click on – Books for Sale.